The sport of mountain biking attracts many different types of people from all walks of life. Some people are good enough to make it a profession whilst others are merely hobbyists who spend their leisure time exploring new trails and planning weekend biking trips. 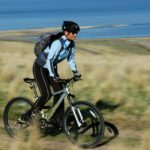 For those new to the sport of mountain biking it is important to practice techniques and skills before attempting any difficult trails. When starting out on your first trail rides try to find a trail that is within your comfort level as these first few trails are important in building confidence and ability on your bike. Before you begin your ride it is important to check over your bike to make sure it is in full working order. Test the brakes, check the gears and test the tires for any potential leaks. Another thing to remember is protection wear. Although it may seem an obvious thing to do it can be easy to forget the simple things, so remember to take a bike helmet on every trip. Other things worth taking are gloves to prevent blisters and sunglasses for those days where the sun is bright enough to cause problems with your vision. The final important things to remember when trail riding are water and repair equipment. Keeping hydrated is one of the most important things to do when participating in physical activities so try to keep a water bottle handy at all times. The repair equipment is for those times when you may get a puncture in the middle of trail riding and need to do on the spot repairs. As you increase the amount of time you are on a bike, you will come across more challenging terrain that will test your riding skills. In these circumstances you will need to know some useful little tricks that will help you traverse such obstacles. One such technique to learn is the bunny hop. The bunny hop is a simple jump that will enable a rider to maneuver their bike over small obstructions such as tree stumps and small rocks. To perform a bunny hop a rider must be able to raise the bike off of the ground completely, gaining enough clearance to pass over small obstacles. To perfect this technique, take some time to practice bunny hops in your free time before any ride, adding objects to jump over so that you gain confidence in your jumps and have an idea on what kind of clearance you are able to get. A popular past time in mountain biking is downhill trail riding. This requires a lot of skill and experience to complete without incident and even the most experienced riders find themselves losing control on these trails. As a beginner it is a good idea to start slowly with some easy descending rides and build yourself up to the more demanding terrain of the steeper downhill trails. Because downhill rides can be quite treacherous don’t be in a rush to attempt the more difficult trails. Instead, learn the easier routes properly first and then, when you are confident enough to take on the other trails, make the transition. Having the confidence to take on difficult trails is an important factor as you will need to be sure of your own abilities when attempting such challenges. Riders who are nervous or unsure are more likely to make a mistake and could seriously injure themselves, so take the time to build up your confidence and don’t be in a rush to attempt experienced rides. By simply spending as much time on a bike and practicing techniques and trails as much as possible, beginner riders can quickly develop into confident, knowledgeable riders.